We’re kind of foodies at our house, so Thanksgiving is generally a gala affair. (See Last Year’s Menu and the Even More Dramatic Year Before) However, I’ve noticed that since I started working full time, I have less and less of a desire to spend my entire day off cooking when it’s a holiday. Go figure. Tony has even less of a desire to cook a big Thanksgiving, possibly due to the fact that nearly all of the everyday cooking at our house currently falls to him. So this year we’ve decided to pare down Thanksgiving a bit. No, make that a lot. In fact, I’m embarrassed to even say what we’re contemplating, nay have actually determined to do. Suffice it to say that our plans for Thanksgiving do not involve either brining the turkey, wrapping it in bacon, cooking it upside down, or even stuffing it. In fact, they don’t involve a turkey at all. Are you ready for it? We’re going to pick up a rotisserie chicken. It was Tony’s idea, since I wouldn’t have been able to bear coming up with such an travesty. However, once he brought it up and I weighed the merits of a rotisserie chicken against the hours of preparation and the reality of turkey leftovers in the freezer for the next several months, I could see he had a point. But his next idea was the real bombshell: Stovetop stuffing. I was not amused. Stovetop stuffing is too far even for me. I think he was mainly attracted by the ease of preparation, but he claimed (out loud!) that he actually prefers it to homemade stuffing. I was offended. Was he referring to the Leek and Wild Mushroom Stuffing I made last year? Or the Apple, Sausage & Parsnip Stuffing the year before? Only when I promised to make a completely normal and unadventurous stuffing this year (and reminded him that I’d already consented to rotisserie chicken) did he relent and agree to the compromise. So I am passing over recipes like Spinach, Fennel, and Sausage Stuffing with Toasted Brioche, Rustic Bread Stuffing with Red Mustard Greens, Currants, and Pine Nuts, and Masa Cornbread Stuffing with Chiles with many a sigh and backward glance. Instead, I have chosen the irreproachable “Simple is Best” Dressing, featuring those old staples of Thanksgiving and Simon & Garfunkel, parsley, sage, rosemary and time. Per the reviews on Epicurious (which one should always, always read, for entertainment value as well as culinary wisdom), I’ll double the herbs and add more broth, especially since I’ll probably sub in sourdough bread if I can get away with it under the nose of Tony, the Thanksgiving Grinch. High on Axa’s list of important foods for Thanksgiving dinner is pumpkin pie. In fact, she’s been asking if we could have pumpkin pie this year since early October. Pumpkin pie is not my favorite thing, but since it doesn’t have a top crust, it is a candidate for my secret weapon/pie crust dodge (aka the easiest French Tart Crust recipe I have ever encountered). She’s looking forward to making it from an actual pumpkin, so there’s no cutting corners there. I am thinking of using this recipe, which includes white pepper, since I love using pepper in desserts and getting away with it. We fell in love with white pepper when we discovered it in Italy, and started putting it in everything. Everything was better with white pepper, until Tony put it in the breakfast oatmeal one morning. It took me awhile to figure out what the weird taste was, but I could barely choke down my oatmeal. We’ll have whipped cream (NOT the kind from a can) with the pie. Pineapple bacon wraps are a Bringhurst family tradition. We used to make them for Christmas Eve, but since we’re so often out of town at Christmastime, we make them for Thanksgiving now. They are as easy as they sound–just slices (or half-slices) of bacon wrapped around chunks of pineapple. I think we sometimes might have used canned pineapple growing up, but we always get a fresh pineapple now. Tony learned how to efficiently cut up a pineapple on his mission in the Philippines. 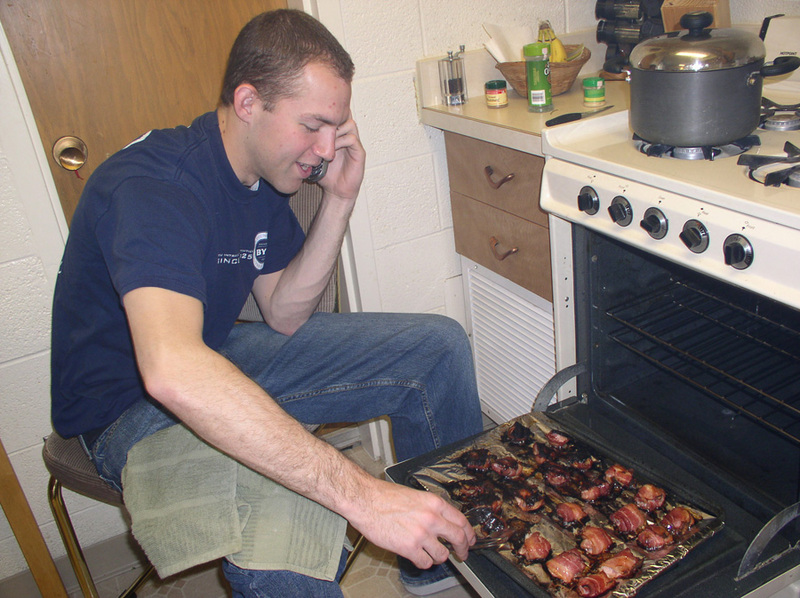 Here’s Benjamin managing to burn the pineapple bacon wraps when we invited him to Thanksgiving at BYU eight or nine years ago. No, that’s not a bad quality photo. It’s the smoke in the air. True to form, Tony suggested that we just buy rolls this year, and get berry jam instead of making cranberry sauce. So no recipes to post for that. And our final menu item is roasted veggies, which we usually cook without a recipe, and are somewhere along these lines. And that’s it; the entire contents of our Thanksgiving spread this year. I decided that everyone in the family was old enough to make what was important to him or her. So I’m making pies, my husband is doing potatoes and gravy, my oldest is making the rolls, and the two youngest will do the cranberries and stuffing. We’re still negotiating on the meat. We got a very expensive ham at Costco last year that wasn’t very good, and none of us like turkey enough to make it worth buying a very expensive turkey at Costco. I’m lobbying for a small bit of ham, a rotisserie chicken (I shouldn’t admit that to you ;)) and some arrachera. Then everyone can be happy. Because arrachera with mashed potatoes is amazing. I’m thinking we might need some bacon-wrapped pineapple. We usually keep Thanksgiving dinner simple because we can never always make the same things every year.